Its Saturday and no rain, so.... that means that it was time for the Sunshine Cycle Saturday morning ride. Man, was it cold! Really, it wasn't that cold - probably the high 40s or low 50s, but when you are out in summer riding gear and you get up to speed, it gets cold. Once we got started, I warmed up everywhere except my fingers and my toes. When the sun got up over the trees, that helped a lot as well. By the time we ended the ride I was feeling pretty good. We did about twenty-eight and a half miles like we normally do. I was relieved we didn't do Woodhaven. That would have croaked me. The most fun I had was on a long gradual climb. I hooked up with Ed and Tony (two of the better riders) and we dropped the whole group and finished yards ahead of everyone. I managed to finish in the top two or three of most of the sprints, but the last couple of climbs, I just ran out of gas. I didn't make the 100 miles this week as I had hoped, but I did get more than 70. I'll try again this week to get in some more. I think if I can get in a ride on Tuesday night, that will help. Last night I was supposed to meet up with several friends to do some laps at Cleveland Park. It took a while for us to get going. I drove the car to the park and realized once I got there that I had forgotten my shoes! We finally got started about fifteen minutes late. Also, a couple of the guys didn't show up until later. The plan in such cases is that the first guys there follow the route clockwise and the late arrivals will go counter clockwise until everyone comes together. Well, the late arrivals didn't do that and we never connected until Chris and I altered our route to try to find them. We ended up riding just one lap as group. After about one lap, we got hit by a rain storm. It lasted for about four laps. Man, it was cold! The water was soaking me and as the wind was blowing by it really cooled me down. It was enough to make my ears start hurting. I would like to comment on the increasing number of bicycle riders in the Greenville area. I think it's great that this sport is being taken up by so many people. However, there are problems with some of the cyclists. On numerous occasions I have encountered cyclists hindering traffic. From what I have observed, not all bicyclists are careful and some are very rude. I've had cyclists show me "obscene hand gestures" when I tried to pass them. The latest incident in my neighborhood prompted me to write. I live in the Pebble Creek area and the roads in my area are narrow and well traveled. Especially in the mornings. Two days ago around 6:30 a.m. I was on the road and barely noticed a cyclist was on the road. This person was not wearing any reflective gear and also the bicycle did not have any lights. He was coming around a curve and causing issues for all drivers. What bothers me is that if something should happen to one of these cyclists the driver(s) will be blamed. However, the roads in most areas in Greenville are not intended for cyclists. I grew up in Europe where parts of the sidewalk are dedicated for cyclists. This is not the case in South Carolina. If cyclists are going to be on the road, they have to obey the rules of traffic. Also, it would be nice of them not to get mad at drivers and make obscene gestures. I am afraid he has a point. There are two things in play here. 1. There is some ignorance on the part of many new riders who have started riding because of the growing popularity of cycling in Greenville. 2. There are some attitudes among riders who have been cycling for years. I believe there is more of number 1 than 2. It should be pointed out though that there are many many riders out there who obey the traffic laws and do everything they can to fit in with other traffic on the road. Besides, while we're pointing fingers... how many riders who have been obeying the law, are wearing relfective clothing, and have lighting on their bikes can tell stories of obscene gestures, horns right as the car is about to pass, various unencouraging phrases being yelled at them, or/and objects thrown at them. Yesterday I took off from work to play in a golf tournament for The Wilds Christian Camp. It was lots of fun! This is a picture of my partner Dan Wooster, myself, Dean Trondle, and Ted Alston. We're standing by the hole sponsorship sign for The Worthwhile Company. Had it not been for Ted, we would have been sunk. As it was, we were still not anywhere near winning. We ended up two under. I came home and hopped on my bike and headed for a ride. I pushed for an hour and broke my previous record. I averaged 19.4 mph for that hour. By the time I reached home, I had riden for 28 miles and averaged 18.2 mph. Boy was I sore when I woke up this morning! My back was sore from golf and my legs were sore from the ride. Gordon is maintaining his momentum. So far in the Chase, the 24 team is averaging the best finishing spot among the contenders. He hasn't taken the lead yet, but only 6 points behind Jeff Burton, he certainly is in striking distance. The race - as far as the fantasy league was concerned - was a back and forth affair. The different pit strategies made it pretty close at some points. Gordon was even 70+ points behind the points leader at that moment at some stages in the race. The key for my team was the eleventh lap when Tony Stewart and Kasey Kahne ended up in the wall. Kahne was Tru-Jr-Fan's driver. At that point, I knew if my guys would just stay running at the end, I would probably win. Then when Earnhardt started fading towards the end, I knew I had it. To make matters even better, Tony Stewart is one of BBuck's drivers. So, I knew that I might be able to pick up a win over my primary competition in the league. Then Harvick went 34 laps down and I was pretty much assured I would put some distance between us. As it stands, my record is 20-6-1 and BBuck comes in at 18-9-0. My mind went to Mike several times during the race. Unfortunately, I received an email during that time telling me that Mike has had more swelling on this brain. They have tried two stints to take the fluid off. In both cases, they ended up drawing blood. He is currently in an induced coma as they try to get his body to rest. Man, cars going around in circles don't mean very much when you consider the battle Mike is facing. Can he catch the momentum? Jeff Gordon took the pole Friday. I knew Dover could be good for him, but I didn't think he would start off that well! Now, if he can just stay up there, we'll be in business. Today is going to be a day of reflection each time I look at the score. Tru-Jr-Fan is best known as Mike to me. Mike is a friend who just recently had an operation to remove a tumor from his brain. He is in a struggle right now simply to recover from the surgery - then he has the long battle through chemo and radiation. Pray for him - especially in the next several days. He has an opportunity to take part in a new process that has a very good success rate in treating this type of cancer, but he cannot start the process until his body recovers from the surgery. Since he is currently battling infection and other issues, he is not able to get it started. I've decided to run Jeff Gordon, Jimmie Johnson, and Mark Martin. I sat Kyle Busch simply because he is so far back, I'm afraid that he may run into trouble coming through the field. Johnson and Martin have some of the best statistics at the track and, of course, Gordon has won his share on the speedway. Yesterday I hopped on the bike and rode a kind of odd route. I didn't follow my normal routes but just kind of felt my way through some neighborhood streets. I wasn't feeling very strong, so I just put in around 13 miles. I felt like I had to get some miles in because I didn't think I would get to ride today. I was supposed to have a breakfast business meeting about the same time I normally ride with the Sunshine guys. Turns out it rained anyway so I wouldn't have gotten to ride with them after all. However, things cleared up and I knew that if I planned to keep this new exercise routine going, I was going to have to get in the saddle. So, I left the house with the idea that I would complete the USACycling Professional Road Race course. I modified it only slightly so that I could use my home as the starting point. By the time I hit Old Buncombe road, I was feeling pretty bad. I could tell that I have not been riding as much. My legs were screaming at me before I even got out of downtown. I almost turned around and went back. But I had done this before and I knew my legs would come back to me. By the time I reached the base of Paris Mountain, my legs were getting into shape. I knew it was going to be tough, but I pushed on up. I was about 3 minutes off of my best time as I climbed the back side. On the way down the front side, I tucked in and had a blast carving the asphalt. I only clocked 45 mph, but it was still fun. One of these days, I am going to hit 50. Coming back into town I really started wearing down. I knew I still had about 7 more miles to go, so I just sucked up and kept cranking. Finally, after riding for an hour and a half, I came home. Not having watched the computer during the ride, I wasn't sure what my stats would be. I figured it would be an average of 15.5 mph. I was very pleased to find that I had averaged 17.1 mph! Next week, I am going to give it a better go. I only rode 52 miles this week. That is down from over 100 miles back when I was training for the metric century. I would like to see if I could break back into that target. I haven't riden much this week :-( After Monday night things have just not worked out. Tuesday evening I got home later from work and then was watching the kids while the beautiful redhead went out to eat with some friends. Wednesday evening we were at church and then last night I was invited to play a round of golf. We'll see if I can get it a short ride tonight before going out tomorrow morning on the regular Saturday morning ride. I'll tell you one thing, I prefer my bicycle to a driver! If I handled a bike the way I swing a club, I'd be in the ditch more than on the blacktop! They say that you can get an idea of what your max heart rate should be by subtracting your age from 220. That would mean that my mhr rate should be 182. Since this is the number that my heart monitor uses as my baseline for workload and workout sessions, it is something I really want to know. I didn't want to accept that my mhr was a 38 year old's. I'd rather have a 204 rate like some of the teens around here have. Of course, I know that isn't going to happen, but I was willing to bet that I could be closer to 190. Well, tonight I hit 188 beats per minute! I really think I could get even more. I hit 188 without noticing any effects other than just starting to run out of gas. I'm told that when you hit your max heart rate, you will feel light headed and you'll start to freeze up. I just crested the hill and started monitoring my breathing and before long, I was back in the upper 160s. The ride was my "regular Greenville training ride." I made my first training ride about two months ago. On that ride I averaged 16.4 mph for the trip. What a difference two months make. Tonight, I did the route and averaged 18.3 mph. It had been sometime since I had done the ride because I have started riding much farther than 12 miles. However, tonight I wanted to push myself as hard as I could. That is how I managed to set a new max heart rate. I got to see the last few laps of the race (from the last restart to the end) after getting home from getting my Vespa. Man, I am glad that I was up against GetAFreeRide. I would have gotten creamed by anyone else. Also, Gordon still dropped some in the points because Harvick won. So, instead of being 40 points back, Jeff is now 50 points. That is a good position. There are nine races left and that ground can easily be made up if the 24 team can just stay consistent. Who would have thought that at this point Jimmie Johnson would be 139 points back? That is going to be hard do come back from. It isn't impossible, so don't count him out yet, but it certainly isn't looking real good. I'm not worried about the fantasy league today. Sure, I know I tied GetAFreeRide once before, but that was a fluke. I'm pretty much assured that I will be on top of the pile at the end of the day. Now, the chase is more interesting. We have the following chasers in the first ten cars of the starting grid: Kevin Harvick (1), Jeff Gordon (2), Denny Hamlin (5), and Jimmie Johnson (7). The other chasers start off in the following order: Dale Earnhardt Jr. (13), Kyle Busch (16), Jeff Burton (22), Matt Kenseth (25), Mark Martin (26), and Kasey Kahne (33). If they finish as they start, it would give Gordon a nice jump up the standings. Of course, I wouldn't count on it. Those cars starting back in the twenties are too good to finish there. Also Gordon has more points than anyone other than Kahne to make up. He will have to clear 40 points to take the lead. Should be a good race. I won't be able to see a lot of it. I have to go try to get my Vespa restarted. Maybe I'll get to see the end of it. I had considered riding my bike up to Sky Top apple orchard this morning. It would have been about at 45 mile ride. Last night I made up my mind to do the Sunshine ride this morning and ride my Vespa up to the orchard along the same route I had mapped out for the bike. Well, if you want to find out how the Vespa ride went, you can go over to Vespatude to read about that adventure. Here, I'll just make some comments about my morning ride. I almost didn't go. It felt so good to just lay there in bed and since I have started riding, I don't get any days to sleep in. Discipline won out. I got out bed with just 30 minutes to eat and get ready. I made it. We did the normal ride for most of the way. I was able to hand with the top set of riders. The way things work is that we go out as a group. Along the way there are a number of pretty tough climbs. As the group nears the climb, some of the riders will sprint to see who will get to the top first. In most cases, I am able to be the fifth or sixth guy over. Now, I'm not saying that I am close to the guys in front of me :-) I hang with them for as long as I can, but invariably, I get dropped and I'll be a number of yards behind. Still, I'm improving and maybe someday I'll be right up there with them. Then I did the a climb I had never done before. Wow. It was tough! 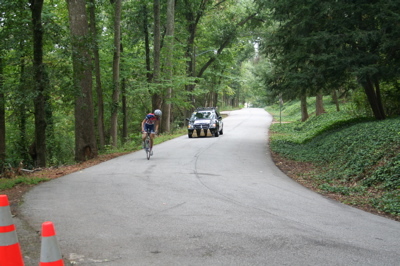 First, you climb a pretty steep grade for about 40 yards on Oakleaf Rd. You then have a short break as you set up for a new climb of about 100 yards on Woodhaven Dr. I was walking it up in my smallest rings and thought I was about to die. This didn't help my average at all. I ended up riding for about 31 miles. I averaged an even 15 mph. That shows how slow I was going climbing because the rest of the time we were running over 20 mph. We were moving right along most of the time. My top speed for the ride was 43 mph. I need to get back on the bike more this week. I only had around 50 miles for the week. That is down from around 150 per week before the metric century. I hadn't riden my Allez since Saturday when I went riding with the Sunshine boys (and girls). During that ride my bottom bracket started making an awful racket. So Tony told me I needed to get it replaced. It was under warranty, so I just needed to leave it with them and they would get the part and fix me up. The job was done today. I picked it up after work, came home and ate, and then headed out to get in an hours ride. I came into the park with an average of 17.5 mph. Within one lap of the park, I had upped that to 18.5 mph. Wow, maybe tonight I would break my record. Climbing Woodland Way for the first time, I was cruising along at 18 mph. I normally am climbing it at about 15 mph. Unfortunately, I just didn't have it in me. My best time in an hour is 19.3 mph. Tonight I pulled off 19 mph even. I ended up doing 23 miles with an average of 17.5 mph. Going home always kills my average because there is a lot of climbing. Right now I am pretty wiped out. Not having riden for several days has my body out of wack. The good news is the bike handled perfectly. No popping sounds. Last night I downloaded my first movie from iTunes for my iPod. It took a couple of hours to download the file, but once I got it on my machine and the iPod, I amazed. The quality was pretty good. The pundits question whether people would want to watch movies on their iPods. However, I think they miss the point of how many people will use the player. I don't think I will be watching the movies on the device that often. However, I will plug the iPod into the 21 inch LCD monitor in my bedroom, into the entertainment system in my den, and into the video system in the Suburban. That is what attracts me to the service. No flipping through books or searching through jewel cases. Easy access whereever you have your iPod. I've already converted many of my movies over to mpeg4 files - I just have not been able to equal the quality of these files from Apple. I found this story from across the pond to be interesting. This researcher put a sensor on his bike that would measure the distance drivers would give him based on whether he had his helmet on and several other factors. I'm still wearing my helmet. I have "used" my helmet before and I would hate to think what would have happened to me without it. Ride safe! Somehow, I don't think this was a recreational rider. Why would you be riding your bike at 4:30 in the morning unless it was your primary means of transportation? Not wise. I won't be able to ride today -- or perhaps a couple of days. Ever since I got my bike, I have had issues with the bottom bracket. There is a lot of play when you put pressure on the pedals. Thankfully, it is still under warranty and I am supposed to take it by Sunshine Cycle Shop and they are going to replace it. Here is the next item I've collected to help me in my training. It is a Sports Instruments ECG Pro 7. I'll admit that I haven't learned how to take full advantage of the computer. "Based on your Threshold Heart Rate or your Maximum Heart Rate the Pro 7 automatically calculates 5-training levels based on contemporary training philosophy. The Pro 7 then automatically tracks the amount and percentage of time you spend in each training zone during your workout." Now, what that means I'm not sure. I primarily focus on the time spent in the fifth zone, the average heart rate, and the workload. There are lots of ways to use the computer that I have not even tried yet. However, just being able to see my heartrate during a ride has been a help. It causes me to focus on recovery between periods of intense output. I'm learning to control my system through breathing and altering my output. This means that we pretty much maintain the order. Tru-Jr-Fan cut into Super_D's lead for third place. He is now just one win back. Thankfully, next week, as the drivers begin the Chase, I am up against the free ride team. 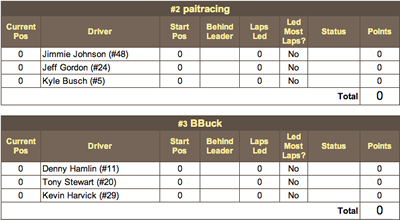 Tru-Jr-Fan and Super_D will be battling out, so there should be some movement for third place one way or the other. We'll see what happens in New Hampshire. Gordon? Well, he slid so far back, he nearly fell off the back end! Starting in third on the track and fifth in the points, he kept going farther and farther back until he finished in 31st place in the race and ninth in the points. Of course, that means he is now only 40 points behind the leader because of the Chase format. First the four wheels... Tonight is the last race of the Race for the Chase. I hope to be able to see some of it after celebrating Child Three's birthday. He is three today! Grandma and Grandpa are coming over and we are going to have a party. Anyway, here is the line up for this evening. It will be nice just to relax and veg while watching them race on one of the better tracks on the circuit. I've had a bad day. I'm hoping that this evening will get me back in balance! Now, moving on to two wheels... I did have a good morning. After not riding it for a couple weeks because of the metric century, I rode with the Sunshine Cycle Shop guys again this morning. I could tell a definite difference in my stamina from the last time I rode with them. It wasn't anything spectacular. We did about 28 miles and I only averaged 15.5 mph. My heart rate average was a very low (for riding) 148 bpm. I think this is because we didn't really push the whole way. There were several times when there would be a sprint to the top of a climb. It took me a while to figure out what was going on. I kept wondering why everyone would ride along casually and then suddenly three or four guys would just take off. I actually won one of the sprints. It was also nice to know that I had earned the respect of some of the regular riders. It felt good not to be one of the tag alongs. I had a rider come up and ask me where I ride and when. It would be nice to form some friendships out there. Yesterday afternoon I did one of my "push for an hour" rides. It didn't start that way. 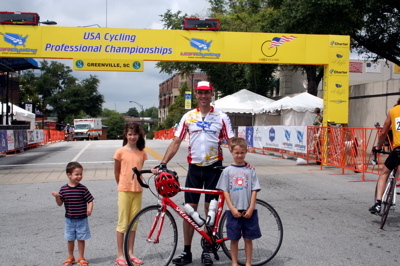 I left from home and started out to do my circuit around Greenville -- the one I did when I first started riding. However, once I got in Cleveland Park, I saw other riders and I wanted to catch up with them, so I decided to stay in the park and push it. I did beat my highest average MPH -- though not by much. The highest before was 19.1. This trip I managed to move it up to 19.3. Once again I hit the max heart rate of 185. I also had the high average bpm of 172. So, I figure my legs are starting to get strong enough to give my heart a workout. Overall, I was able to leave my house, ride 22.24 miles in 1:12:45, and average 18.3. That is 3 minutes faster than the last time I did that ride. I came up behind a guy who had an Assault on Mount Mitchell 2006 jersey. I asked him if he had done the climb. He said he had done it this year. One look at the muscles in his legs and you had to believe him. I told him what I was doing and he suddenly said, "Well, hop on and let's go!" He then took off. I jumped on the back of his rear tire and before I knew it we were hitting 27 mph on the flat. He sustained this for the entire length of the lower part of the circuit. Before we finished my heart was going through the roof and I was really pushing to stay up with him -- and I was in his draft! In some past posts I have listed some of the items I have added to my Specialized Allez to add some comfort or safety. I'll continue that today with my cycling computer. 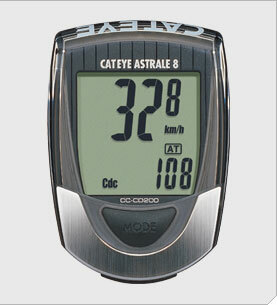 It is the Cateye Astrale 8. It doesn't have everything, but it certainly does the job. Would I like to have a computer that I can plug into my Mac and download the data? Sure. Do I need a computer that does that? No. It has most of all the options that the higher end Cat Eye computers except things like a backlight, 2nd tripmeter option, and a heavy duty wire. I do like the cadence and mph feature. I had never concerned myself with cadence back on the mountain bike. Now I can see how it is helpful. Though, average mph can accomplish the same goal. All in all, combining this cycling computer with my heart monitor, I am able to get a good picture of where my body stands and what I can accomplish. The thing that stands out to me is that I have made a lot of progress in one month, but there still alot of room to grow. That is exciting! I went on my first ride on my road bike since the Palmetto Peloton. I hooked up with my nephew Paiton and a friend John. We met at the bottom of Paris Mountain. My goal was to set a benchmark for future rides. We left from the CVS parking lot and headed up. Paiton led the way. Of course, he is a teenager. I got to thinking that he was going to up and leave me. Thankfully, he has only been riding for about a week. On the first big climb, I was able to drop him. I crested the summit and started down the backside. I could have picked up some time there, but the road was a little wet. I had no desire to wipe out. So, I enjoyed a nice leisurely coast on down. I made it over mountain in 23:30 minutes. Paiton was down about two minutes later. John wasn't there, so we decided to go ahead and start up and meet John as he was coming to us. As I was going up my cell phone rang. It was John. He had gotten sick and was on the side of the road waiting for us. I made it to the top of the back side in 15 minutes. As I neared the "You made it!" paint, I ran into John. Paiton had caught up with me about two minutes after I reached the top. John had already started off before Paiton showed up. The plan was to take off and see how fast I could make it down the front side. I was feeling really good. Just as I was reaching the stretch where I could get up some speed, I came up behind an SUV. I kept having to brake so I wouldn't come up on the back of it too quickly. Turns out the best maximum speed I could get was 45 mph. Had I been able to run free, I'm certain I could have hit 50 mph. Overall, it was a good ride. I now have my target to beat. Also, I hit a max heart rate of 185. It happened just as I made the 15 mph hairpin turn near the top. I was able to stay on the pedals and keep driving as the monitor read 185. I stayed up to watch the end of the race because the race between BBuck and me was so close, I couldn't go to bed. During the middle of the race the lead was swinging back and forth. Then toward the end fuel mileage became a factor and who knew who might win at that point. Thankfully, I came out on top. I've now moved into the lead at 17/6/1 to BBuck's 16/8/0. That is a little bit of a cushion for me. Next week I go up against Super_D while BBuck races against GetAFreeRide. So, I'll need that extra cushion. I was watching Gordon move to the front and it looked like he was in a position to really do some damage. As he closed in on the lead car, he was the fastest on the track. However, under caution, he pitted and had to come back in because of loose lug nuts. He came back for a 5th place finish. It was actually more fun watching him work his say back from 26th. In the process, he picked up one spot in the standings and I'm breathing easier thinking about his chances for the chase. Today, I took my trusty Pro-Flex and headed to Cleveland Park. There is a spot on Woodland Circle that I thought would be a good place to take some pictures. 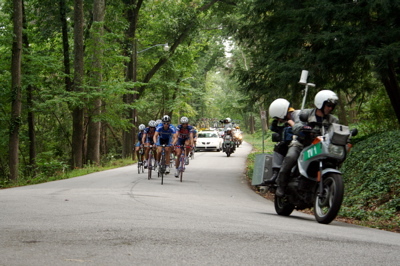 Here I'm including some pictures from lap three of the USA Cycling Professional Championship. By the way, George Hincapie, riding on his home course, won the race. Here the leaders (at that point) head up the hill after going through the feed zone. Most had taken on their carb load by this time. In this first group, I could only pick out Levi Leipheimer in this group. It was hard to distinguish who was who looking through a view finder. The pictures didn't tell me much either. There was a small group of riders between the initial group and this one. Again, I couldn't figure out any of these riders. If you know any of them, point out which is which. This picture is sad and kind of funny in a sick sort of way. I watched this lone rider come up the hill. He was plodding along. He then looked back and saw the sweeper car coming up behind him. Suddenly he put his head down and pushed a little harder. I'm afraid that before the day was over, he had to get off the bike and get in the van. He was fading and he still had to do Paris Mountain two more times. I admire him though. He had already done Altamont Rd. three times. I turned to an official photographer standing nearby. I told her, "I wouldn't need a sweeper car. I would need a scooper car!" It was fun. I would have liked to have chased them all around to take in the whole spectical. However, I had other things to do and was not able to be at the finish line. I sure hope that they will be back next year. It is show down time in the NASCAR fantasy league. Today I am up against BBuck. Whoever wins today will take the lead. Thankfully, I am ahead by "half a race." If I win, then I'll extend my lead. If BBuck wins, it will still be close. I'm definitely sitting Martin today. He seems to have gone flat. While it is cool having all four of my drivers in the top ten, I'm not so sure I will when today is done. Martin does have a little bit of a cushion, but who knows. Shrub is on a tear. He is doing well and momentum seems to be on his side. Frankly, the driver I think could sink me today is Jeff Gordon. The race is late - they will probably roll off at 8 p.m. I won't get to see the beginning because I am supposed to join someone for meeting after church tonight. I'm not sure I'll watch it anyway. Fontana can be boooorrrrriiiinnnnggggg. There is another race today. 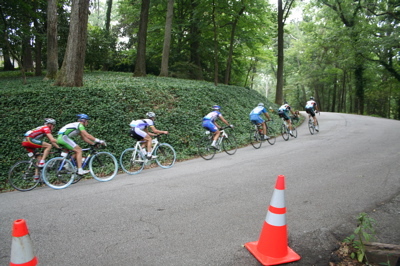 The USACycling Professional Championships are in Greenville today. After lunch, I think I'll take my camera, hop on a bike, and see if I can catch a little of it. If I'm able to do it, I'll include some of the pictures here. I got up this morning, ate my oatmeal and cinnamon roll, and then headed over to downtown Greenville for the metric century ride I have been training for. I didn't know what to expect. Two questions were on my mind: 1) how would I do riding in a large group, and 2) how would I do climbing Paris Mountain after riding for 50 miles? When I got there I ran into two guys I knew, Miles and Matthew. One is a senior in college and the other is in his first year of law school. So, they were about 15 years younger than I am. Both are pretty good cyclist. The only thing in my favor is that Matthew had been in Mexico much of the summer and hadn't riden in awhile. We rolled off. Everything was nice and easy and a little frustrating since we had all the stop lights. However, once we got on Old Buncombe Rd. we started getting in a rythmn. I could tell then that things were going to be good. Normally, I start stiffening up about the time we reach Altamont road. However, today my muscles felt good at the start. My first question was answered in a positive way. Riding in the group really helped to take some of the load off. Drafting was a big help. Also, Miles and Matthew really challenged me and where I would normally slow because I wasn't feeling like I would like, I kept going so I could hang with them. The only negative about the group aspect came shortly after we passed our second SAG. We were in a group of about 15 riders. I was probably 11th back right behind Miles. Matthew was behind me. Up ahead I heard the sickening sound of metal on metal and a groan. I looked up and saw bicycles piling on top of each other and people falling to the pavement. The rider just in front of Miles went down hard and Miles had to ride up and over her rear tire. I had to swerve around both her bike and her as she rolled away from it. She stayed down as well as another rider. Someone called for help and Miles, Matthew and I set off again. That was close! I rode on the adrenelin from that near miss for several miles. The next eventful thing brings us to question two. Paris Mountain. I turned left onto Altamont Rd. with Miles and Matthew. We were the only three in this group. Miles pretty much off and left us. He actually seemed to have fun climbing that hill. Matthew and I put it as small rings and "walked" it up. However, we made it! We even passed a couple of riders on the way. We made it, but on the way down the other side, I was toast. I couldn't get my legs to do anything. I wanted to get in the upper ring so I could fly! But I couldn't even pedalling downhill was a chore. So, I just coasted as much as I could until I got to the bottom. Once there, I stopped and answered some questions for a guy who was from out of town. As I pulled away from him, I came to a stop sign and had to stop. I didn't get my shoe out of the pedal fast enough and down I went! I didn't even get a scrape, but I did bend my front brake lever a little. Nothing big. The good news is that I got another adrenelin rush at that point and the problems I had with my legs went away. The three of us took it on in from there without further incident. We crossed the finish line three abreast. I felt pretty good hanging with those young wipper snappers, though I think they could have done better had I not been there. We finished the ride in about 3:39. I had thought it would take me about four hours, so I was happy with that. Now, I think I'll take a break from those kind of rides for awhile! The chimes in the steeple of the church across the street started ringing and I looked at the clock: 10 o'clock. The Time Trials for the USACycling Professional Championship are under way. I'd love to be out there watching them roll off, but I have too much to do here. As I am working, I'm drinking lots of water. My plan is to get 128 ounces down by the end of the day. I want to make sure I'm plenty hydrated before riding tomorrow morning. The only problem is that it makes me have to keep running to the restroom! Well, I guess it will help clean out my system! Though I won't get to see the Time Trials, I do plan to catch some of the race on Sunday. I'll probably take my bike and ride up to Paris Mountain. I'll be sure to take my camera as well and try to get some good shots. Cycling mania is hitting Greenville. At least you get that impression from the press. I hope it isn't just manufactured hype. I think being a key city on the East Coast for cycling would be a very good niche for us. It would be great to see lots of people out in support. Speaking of lots of people. The Palmetto Peloton Ride folks say they have over 400 people signed up! I think that is for all events and not just the metric century. Still, the idea that there are lots of people participating is comforting. Surely I am in better shape than at least one of them!